Mr. Boris Johnson, who resigned a few weeks ago as Foreign Secretary of the UK as he was unhappy with Prime Minister Theresa May’s handling of the Brexit negotiations, has dominated the British press all weekend. Here’s a rundown of what happened. Yesterday, Mr. Johnson wrote an opinion piece for the Mail On Sunday, in which he stated that Ms. Theresa's May's Brexit plan meant that the Tory government had "wrapped a suicide vest" around the British constitution and "handed the detonator" to Brussels. His words called for condemnation from many of his Tory colleagues, of whom 12 have by now threatened to leave the party should he ever become Prime Minister. It also became known over the weekend that Mr. Johnson was divorcing from his wife Ms. Marina Wheeler, who claimed she had enough of his “multitude of affairs,” claiming that it had been “more than then” different (mostly blond) girls during the course of their marriage. Ms. Wheeler would be serving divorce papers branding him an 'adulterer' as early as Monday. 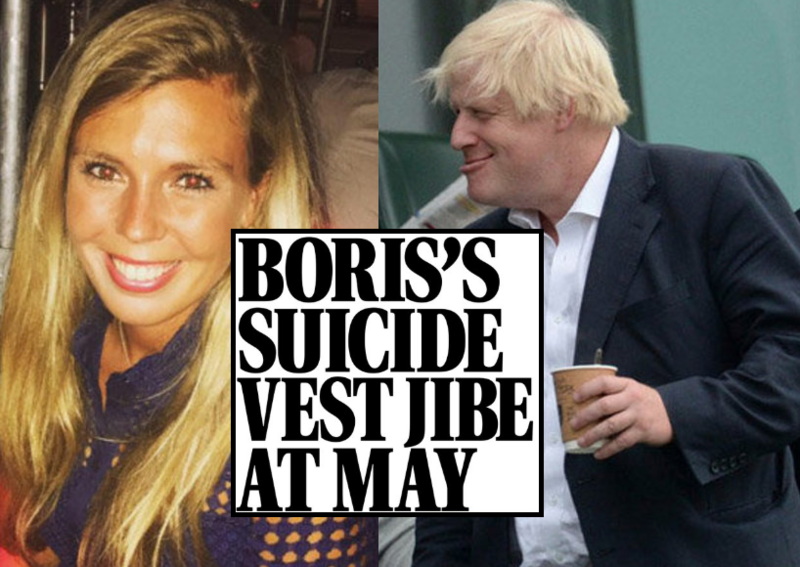 Tory MPs then had to read fresh revelations about his relationship with Miss Carrie Symonds, the 30-year-old who had recently quit as party communications director last month. Sources last night revealed to British tabloid press that the pair had been on a series of high-class dates in London (including at the discreet Rosewood Hotel in Holborn). Pictures of Mr. Johnson with the pretty blonde were spread all over the British press. With the Conservative party descending into open warfare, parliamentary allies of Mr. Johnson stated that the office of Ms. May was involved in a clear smear campaign with the leak of a ‘dirty dossier’ on his love life. Weird that Boris speaks the Truth about the State but lies to his wife. Men of conscience please please stay straight.